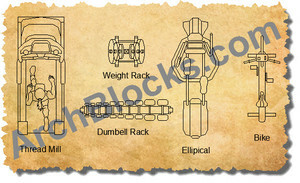 ArchBlocks.com is proud to offer one of the first CAD symbol libraries for health and fitness room design. It is almost impossible to find CAD exercise equipment in AutoCAD .DWG format anywhere on the internet, well, look no further! This is an excellent set of AutoCAD blocks and CAD symbols for exercise equipment. This library of health and fitness equipment is all you need to design a beautiful home gym. This CAD exercise equipment symbols can be downloaded NOW!